Nose: Fudge, caramel toffee, golden syrup, brown sugar, caramel popcorn, and oat biscuits. Palate: Jam on burnt toast, cinnamon, a little bit spicy. Also some grandfather tawny, cloves, and some nutmeg. Mouthfeel: Although fairly lightweight in comparison to the palate and nose; it has a medium weight. It’s also quite dry, and has a slight alcohol tingle. Finish: Spicy, yet sweet. The finish is super long, and my mouth jut can’t stop watering for a really long time. This bottling is 95% 15 year old Sulivan’s Cove (cask HH593), and 5% 7 year old Lark (cask #644). It has been married and aged at Heartwood in port casks, and bottled at the cask strength of 69.1% in 2015, with no colouring and no-chill filtering, as one of 160 bottles. Like many Heartwood releases (at least the ones I’ve been lucky enough to try), this bottling is like a deep rich Speyside Scotch on steroids. For those that aren’t used to Australian whiskies, unlike Scotch or Irish whiskies the angels take more water than alcohol, so the cask strength rises as the whisky ages. For Heartwood, the angels take an average of 8% total volume per year. This whisky in particular can handle quite a bit of water dilution without loosing any character. People who are unused to drinking whiskies with such high ABVs would do well to add a bit of water to a dram of this. 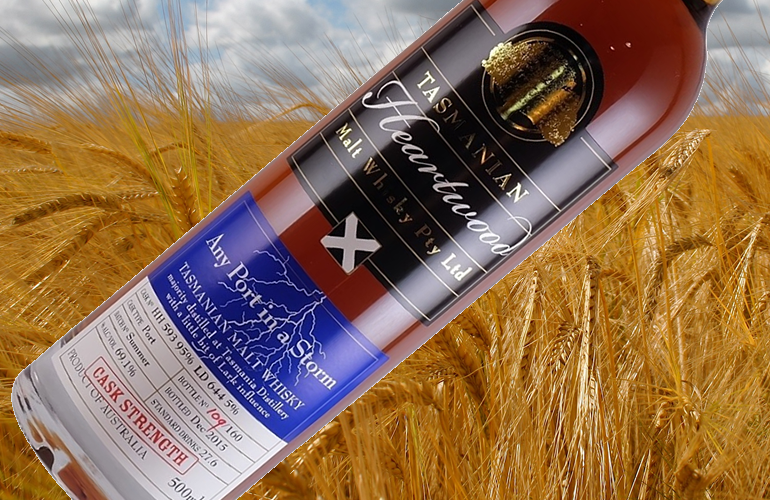 Heartwood is one of, if not the, leading independent whisky bottlers in Australia. Tim Duckett founded Heartwood in 1999, and now has over 7000 litres of Australian whisky maturing in a variety of barrels. Heartwood controls every part of its whisky – specifying everything from the barley, through to the peating levels prior to distillation, and filling their own barrels with the whisky from the start. Quoting the Heartwood website: “We are there to determine the amount of peat used for production. We are there when the spirit is produced. We are there to select the barrel. We are definitely there to sample the whisky as it matures”. This whisky was one of 160 bottles, a run total that is not uncommon for Heartwood whisky. This can make getting a bottle a little more interesting than most Scotch or Bourbon whiskies, but the effort (and cost) required is more than worth it for the result. If you haven’t tried Heartwood’s Any Port In A Storm, I highly recommend that you try and find some. If you haven’t tried any Heartwood whisky yet; you’ve been missing out big time!